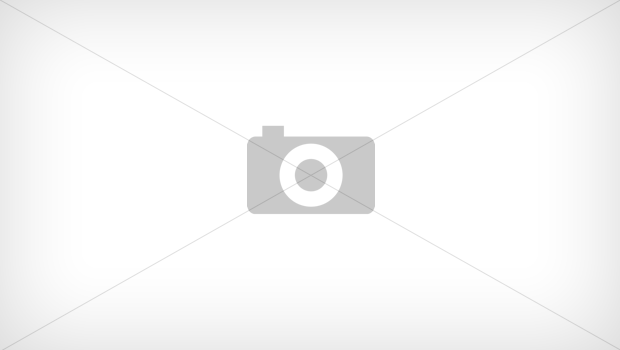 What2Learn » Creating W2L Topics – why and how? Topics are the key addition to W2L version 3 and effectively make it possible for you to shape the educational content within the system to suit the specific requirements of your students. If you want to see the scores your students have attained in some of the games you have created using our game generator you will need to create Topics. Topics are collections of games that you make available inside the main W2L system. Not only will you be able to track student achievement through these topics but students will be able to earn credits for their micons by completing your games. You need to have made some interactive learning games and quizzes using our game generator. Once you complete each game you need to make a note of the reference number of each of them. 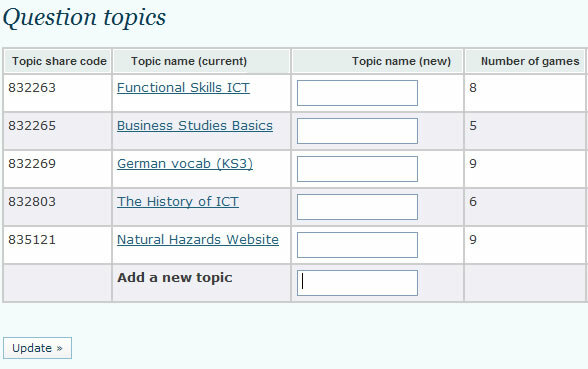 Log in to your W2L teacher account and select ‘Topics’ from the side menu. You will then see a table like the one shown below which shows you any topics you have already made. It also gives you the option to add a new topic – simply enter the name of your new topic and press the submit button. You can add as many different topics as you like. Once you have created a topic you can click on it’s name to begin adding games to it. Any games you have already added to this topic will be listed (see below). 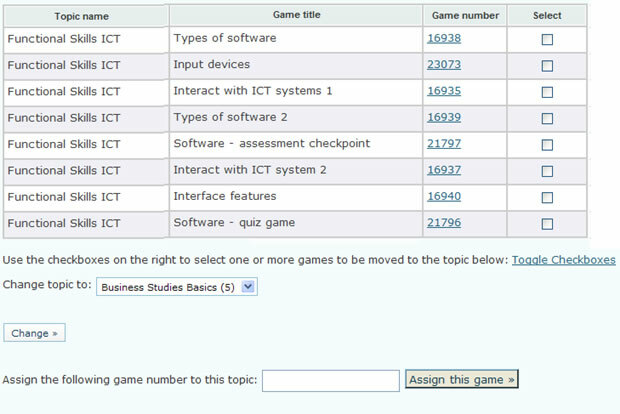 To add more games to the topic you should enter the game number in the input box below the table and press ‘Assign this game’. You can add as many games as you want to your topics. You can also add games using a widget on the dashboard when you first log in. Now that you have created your topic you need your students to ‘unlock’ it to gain access to it. To do this they will need to log in to their W2L account and enter your topic’s share code into the sharing box on the dashboard. 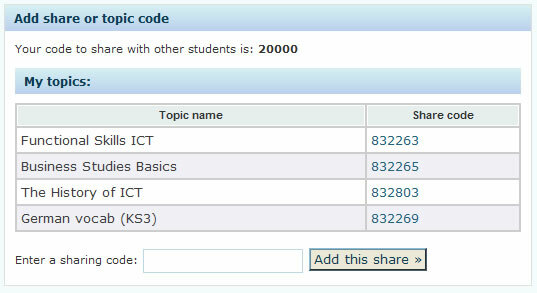 You can see the share code of your topics by pressing ‘Topics’ on the sidebar – see the image in Step 2 above. Once students have entered the share code of your topic they will see a link on their dashboard to your topic and all of the games it contains, as shown below.